Rigid Brome (Bromus diandrus ssp. rigidus (=B. rigidus)) is a monocot weed in the Poaceae family. In South Australia this weed first evolved resistance to Group A/1 herbicides in 2007 and infests Beans. Group A/1 herbicides are known as ACCase inhibitors (Inhibition of acetyl CoA carboxylase (ACCase)). Research has shown that these particular biotypes are resistant to clethodim, fluazifop-P-butyl, haloxyfop-methyl, quizalofop-P-ethyl, and tepraloxydim and they may be cross-resistant to other Group A/1 herbicides. Greenhouse trials comparing a known susceptible Rigid Brome biotype with this Rigid Brome biotype have been used to confirm resistance. For further information on the tests conducted please contact the local weed scientists that provided this information. There is no record of differences in fitness or competitiveness of these resistant biotypes when compared to that of normal susceptible biotypes. If you have any information pertaining to the fitness of Group A/1 resistant Rigid Brome from South Australia please update the database. The Herbicide Resistance Action Committee, The Weed Science Society of America, and weed scientists in South Australia have been instrumental in providing you this information. Particular thanks is given to Peter Boutsalis, and Christopher Preston for providing detailed information. Boutsalis, P. ; Preston, C. ; Gill, G.. 2012. Herbicide cross resistance in Bromus diandrus and B. rigidus populations across southeastern Australia. : 224 - 228. Herbicide resistance to Group A (AC Case-inhibiting herbicides) and B herbicides (ALSinhibiting herbicides) in Bromus diandrus and B. rigidus is becoming more common in southeastern Australia but there is limited information available on its regional distribution in either species. At present it is unclear if resistant brome populations differ in their response to different herbicides within the same herbicide group. Another unresolved question is related to the herbicide dose response of resistant brome populations. This study identified differences between Group A herbicides in their activity on resistant brome. However, increasing herbicide dose only marginally improved weed control in most cases. Varying degrees of Group B resistance was also detected in four brome populations. These initial findings suggest that increasing herbicide dose is unlikely to improve brome control but some Group A and B herbicides are more effective than others in controlling resistant populations..
Broster, J. C. ; Koetz, E. A. ; Wu, H.. 2012. Herbicide resistance frequencies in ryegrass (Lolium spp.) and other grass species in Tasmania. Plant Protection Quarterly 27 : 36 - 42. In January 2010 a random survey was conducted to determine the frequency of herbicide resistance in populations of Lolium spp. (ryegrass), Avena spp. 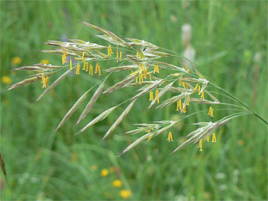 (wild oat), Bromus diandrus Roth. (brome grass) and Hordeum lepinorum Link (barley grass) across the cropping region of Tasmania, Australia. A total of 84 paddocks were surveyed with 80 containing the aforementioned weed species, resulting in the collection of 76 ryegrass, 16 wild oat, seven brome grass and five barley grass samples. These samples were then screened against the most commonly utilised herbicide groups for annual grass control in Australia. Ryegrass resistance frequencies were highest to aryloxyphenoxypropionate (18%) and sulfonylurea (24%) herbicides with lower incidences of resistance to cyclohexanedione (1%), imidazolinone (7%) and dinitroaniline (1%) herbicides. Sixty four percent of ryegrass samples tested against five herbicide groups (aryloxyphenoxypropionate, cyclohexanedione, sulfonylurea, triazine and dinitroaniline) were susceptible to all herbicides, 27% were resistant to one herbicide only, 7% to two herbicide groups and one sample was resistant to three herbicide groups. In the other species collected, resistance was found only to aryloxyphenoxypropionate herbicides with two wild oat and one barley grass samples exhibiting resistance to herbicides in this group. The frequency of resistance observed in screened populations in this survey is much lower than that found in recent surveys of southern Australian cropping regions. A lower frequency of observed herbicide resistance in Tasmania, combined with our ability to use the knowledge gained from 20 years of herbicide resistance management, should result in a predictably slower spread of herbicide resistant grass weeds than experienced in many other regions of Australia..
Escorial, C. ; Loureiro, I. ; Rodríguez-García, E. ; Chueca, C.. 2011. Population variability in the response of ripgut brome (Bromus diandrus) to sulfosulfuron and glyphosate herbicides. Weed Science 59 : 107 - 112. Ripgut brome has become a problematic weed in Spain both as a consequence of the continuous cropping of winter wheat through minimal tillage systems and its difficult control with selective herbicides. Ripgut brome populations collected in the regions of Castilla-León and Cataluña, two main cereal-growing areas in Spain, were screened in the greenhouse for response to sulfosulfuron, a selective herbicide for the control of brome grasses in wheat, and to glyphosate, often used as a pre-plant knockdown to control bromes in no-till systems. The fresh weight percentage relative to the untreated controls was calculated for each ripgut brome population and herbicide and was used as a measure of the herbicide response. Results showed variation in fresh weight response to both herbicides among populations. Fresh weight of the populations after sulfosulfuron was applied at the two-leaf stage at a rate of 20 g ai ha-1 varied from 3% in the most susceptible population to 35% in the most resistant; the response was similar (6 to 38%) when the herbicide dose was reduced to half. For glyphosate at 800 g ae ha-1, fresh weight varied from 2 to 25% among populations, but the range of variation in fresh weight response increased as herbicide dose decreased to one half, with rates of from 4% to 90% among populations. The location of the collection site (inside the field or in-margin) showed no differences in response to both herbicides, but there was a statistically significant, geographically correlated differentiation for glyphosate response, with a greater resistance in the populations from Castilla-León. Undamaged plants were found after treatments with both herbicides, showing differences in resistance among plants. The study shows inter- and intrapopulation variability for the response of ripgut brome to sulfosulfuron and glyphosate. The implications for resistance development are discussed within the framework of relationships of the structure of the populations relative to their herbicide response..
Barroso, J. ; Loureiro, I. ; Escorial, M. C. ; Chueca, M. C.. 2010. The response of Bromus diandrus and Lolium rigidum to dalapon and glyphosate I: baseline sensitivity. Weed Research (Oxford) 50 : 312 - 319. The establishment of Bromus diandrus and Lolium rigidum baseline sensitivity to glyphosate and dalapon herbicides was studied for the North Central region of Spain. A rapid method in Petri dishes and a plant assay method were evaluated. The studied populations of both weed species showed sensitivity to both herbicides. The rapid method to establish the sensitivity baseline for these species worked properly for dalapon and a good correlation was found between Petri dish and plant assays. In the case of glyphosate, the rapid method was not sensitive enough, so baseline sensitivity establishment would have to be determined with plant assays. The baseline sensitivities will allow us to determine quickly and accurately any variation in the sensitivity of these weeds against these herbicides over time and to detect, at an early stage, the beginning of any trends towards resistance..
Barroso, J. ; Escorial, M. C. ; Chueca, M. C.. 2008. Study to establish the sensitivity baseline of Bromus diandrus populations to glyphosate. : 161 - 164. The introduction of herbicide tolerant wheats can favour the appearance of resistant weeds by using in excess of a unique herbicide. According to the EPPO's directives it is now, previous to the introduction of glyphosate as a new herbicide for wheat, the optimal moment to detect the sensitivity of weeds of this crop to this herbicide. In particular, in this work, the sensitivity of Bromus diandrus Roth. to glyphosate has been determined so that in a future any variation in the tolerance of this weed to this herbicide can be detected in a precocious form..